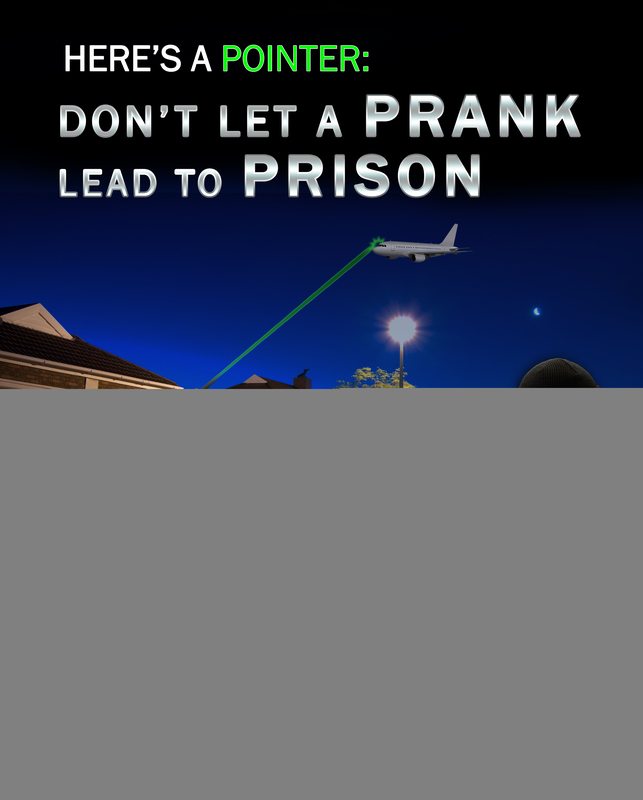 FBI public service announcement illustrates dangers of pointing lasers at aircraft. Today the FBI announced a program aimed at deterring people from pointing lasers at aircraft—a felony punishable by five years in jail—and rewarding those who come forward with information about individuals who engage in this dangerous activity. The new initiative—which includes a campaign to educate the public about the dangers of “lasing”—will run for 60 days in 12 FBI field offices where laser strikes against aircraft are prevalent. A key part of the program is reward money: The Bureau will offer up to $10,000 for information leading to the arrest of any individual who intentionally aims a laser at an aircraft. 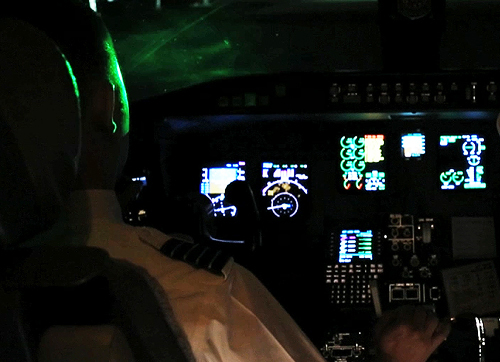 When aimed at an aircraft from the ground, the powerful beam of light from a handheld laser can travel more than a mile and illuminate a cockpit, disorienting and temporarily blinding pilots. Those who have been subject to such attacks have described them as the equivalent of a camera flash going off in a pitch black car at night. Since the FBI and the Federal Aviation Administration (FAA) began tracking laser strikes in 2005, there has been a more than 1,000 percent increase in the number of incidents with these devices, which can be purchased in stores or online for as little as a few dollars. Last year, 3,960 laser strikes against aircraft were reported—an average of almost 11 incidents per day. And it’s estimated that thousands of attacks go unreported every year. Last year, 3,960 laser strikes against aircraft were reported. 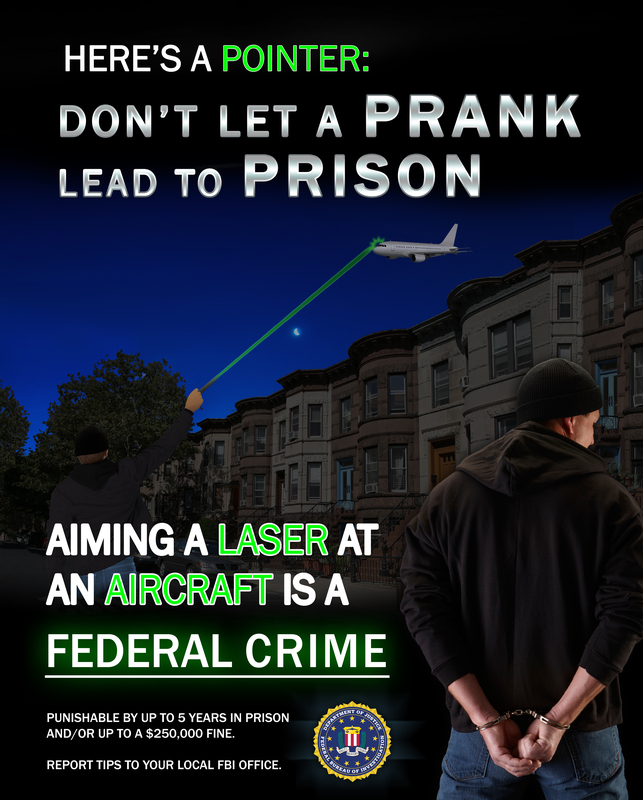 The FBI will offer up to $10,000 for information leading to the arrest of any individual who intentionally aims a laser at an aircraft. “We hope that more public awareness about this issue will lower the instances of laser strikes,” Johnson said. “We also want to encourage people to come forward when they see someone committing this felony—one that could have terrible consequences for pilots and their passengers.” As of December 2013, the FAA had documented at least 35 incidents where pilots required medical attention after a laser strike. Interfering with the operation of an aircraft has long been a federal crime, but the FAA Modernization and Reform Act of 2012 specifically made it a federal felony to knowingly point the beam of a laser at an aircraft. The new law lowered the threshold for prosecution, Johnson said, “and the trend is on the rise for jail time in these cases.” Last month, for example, a 23-year-old California man was sentenced to 21 months in prison for aiming a laser pointer at a Fresno County Sheriff’s Office helicopter. Court records showed that the man deliberately tracked and struck the aircraft. The 12 FBI offices participating in the new program are Albuquerque, Chicago, Cleveland, Houston, Los Angeles, New York City, Philadelphia, Phoenix, Sacramento, San Antonio, San Juan, and the Washington Field Office. 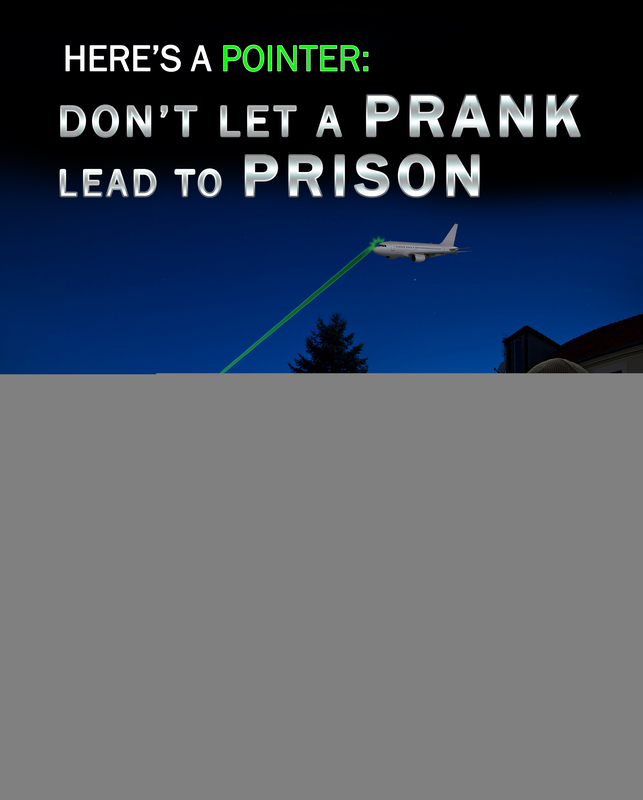 If you have information about a lasing incident or see someone pointing a laser at an aircraft, call your local FBI office or dial 911. A suspect directing a laser pointer at a helicopter is arrested by police on the ground. The first in a series of stories looks at the FBI’s innovative approach to a serious problem. Ongoing series looks at FBI’s role investigating murder spree in Atlanta that began in 1979.